Yakima Skybox 21 Cargo Carrier , Truck & Car Racks from Proline: Thule Racks, Yakima Ski Racks, Bike Racks Canoe and Kayak Racks Cargo Carriers and Truck accessories. 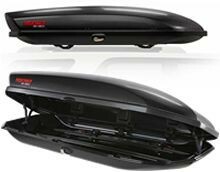 Yakima 8007337 Skybox 21 car roof top cargo carriers. 21 cubic feet of locking storage capacity.